It's understandable that with so many signals and satellites there's bound to be some conflicts, and so it has been recognized by The National Oceanic & Atmospheric Administration (NOAA) as they explored technical solutions for weather satellite data interference resulting in them selecting Harris Corporation (NYSE:HRS) to design a system to monitor cellular signals interfering with critical weather satellite data. Harris is developing a Radio Frequency Interference Monitoring System to track, aggregate, and notify NOAA and wireless carriers of interference incidents. Harris built the satellite ground system which flies NOAA’s Geostationary Operational Environmental Satellite-R (GOES) weather satellite series, operates the instruments and processes the weather satellite data. In addition, Harris built the main weather satellite instrument for the GOES-R program, which provides the imagery and information used by the forecasters for severe weather. Several weather satellites soon will begin sharing frequency bands with wireless communication companies across the United States because the sale of spectrum by the government, combined with the launch of more complex weather satellites, increases the potential for signal overlap and interference. This could cause problems for NOAA and other federal agencies relying on the quality of satellite weather data. 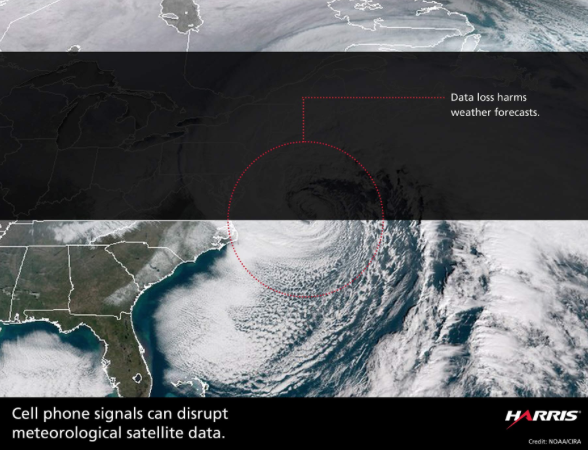 Eric Webster, vice president, business development, Harris Space and Intelligence Systems said that cell phone signals can potentially disrupt critical weather information before it reaches satellite ground processing centers. Since weather satellite data is critical to severe weather forecasts, any interference could impact public safety and have devastating consequences.